If you regularly use your notebook on your lap you'll probably know that they can get uncomfortably hot and in some cases almost unbearably hot. That's not only bad for the components inside your notebook but if you're male it's also bad for you as this heat can reduce your fertility. That's were a notebook cooler comes in handy. The cooler will help to dissipate the heat and will make it bearable to use the notebook on your lap. However, if you're really concerned about your offspring it's a wise idea to put your notebook on a table/desk as scientists claim that just the position required to balance a laptop on your lap can already increase your scrotum temperature by as much as 2.1°C. In the past couple of years I've already taken a look at a couple of notebook coolers and most of these worked pretty well. 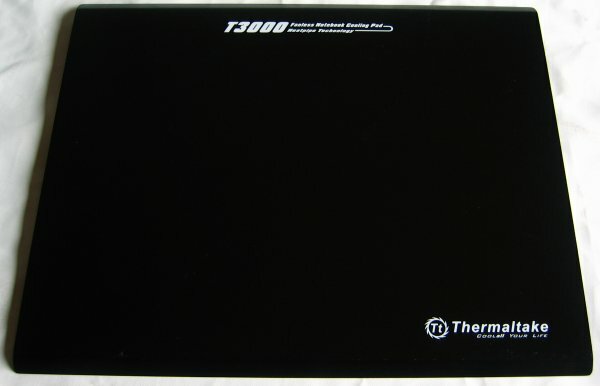 All these coolers mainly relied on active cooling (one or more fans) to keep the notebook cool but today I'm taking a look at the ThermalTake NBcool T3000 heatpipe notebook cooler which is entirely passive. Before I got this product I was quite sceptic about the cooling capabilities of a passive laptop cooler and thought it would only result in a slight temperature drop. It's going to be interesting to see if my prejudice was true. The NBcool T3000 ships in a stylish plastic blister package. These packages are sometimes very hard to open but with the T3000 this wasn't the case. Inside the box you won't find much. 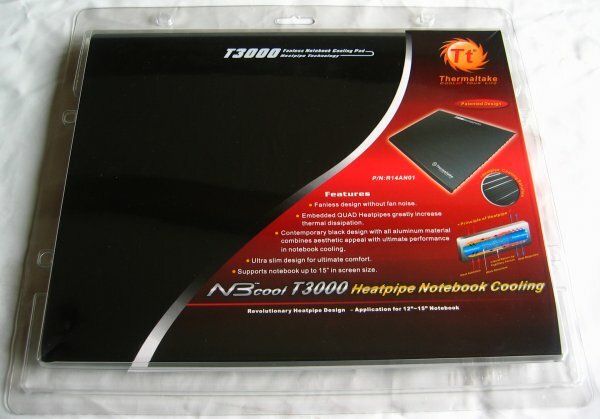 Basically, the T3000 heatpipe notebook cooler is an aluminum plate with some heatpipes for rapid heat dissipation. Embedded QUAD Heatpipe greatly increase thermal dissipation. Contemporary black coating with all aluminum material, combines aesthetic appeal with ultimate performance in notebook cooling. Ultra slim design for ultimate comfort. Supports all notebook up to 15" In screen size. The front of the cooler is smooth and has a beveled edge. The aluminum has a black coating and looks pretty good IMO. The cooler is designed for 12" to 15" notebooks, for 17" or higher notebooks it's a bit too small. The back of the cooler has lots of aluminum fins and four aluminum heatpipes. 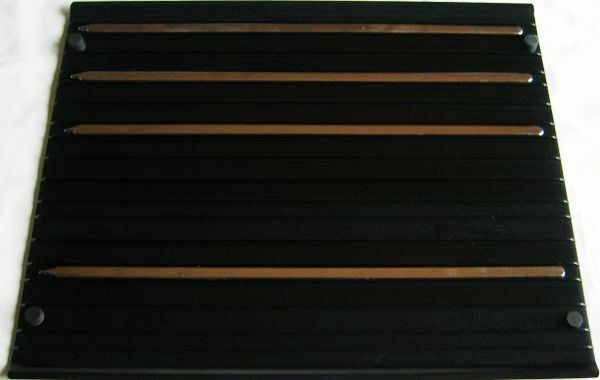 Three heatpipes are located near the top and one near the bottom of the cooler.